The discovery of a fake polling booth in rural Zimbabwe on Wednesday by independent election monitors has added a new dimension to concerns of manipulation by President Robert Mugabe's ZANU-PF as millions queued across the country to vote for their next government. Early voting in Zimbabwe's election was largely peaceful with reported incidents reflecting the tactics that Mr Mugabe's supporters have deployed throughout campaigning to ensure the incumbent retains power. In sharp contrast to the horrific violence of the last election in 2008, campaigning this year has been characterised by intimidation and the voting process by poor logistical organisation that appears aimed at keeping the vote low. Independent monitors described the discovery of a bogus polling station in Matabeleland, manned by a lone ZANU-PF activist, as worrying and said they are investigating whether it is isolated or a piece of a bigger jigsaw to dupe rural voters. Two million more ballot papers have been printed than there are voters, and thousands of ballot papers are unaccounted for. Independent election monitors are now investigating the presence of bogus polling stations across the country, said Debra Mabunda, spokeswoman for Matabeleland region monitors working with an umbrella group called Situation Room. "In Gwanda, Ward 10, Bar Compound, there was a polling station that was manned by one polling agent, a ZANU-PF agent. The polling station was not listed under a list given to all stakeholders by the Zimbabwe Electoral Commission (ZEC). We informed other political parties in Gwanda and they have since sent their polling agents there," she said. "We are now investigating whether there are many such polling stations. This is a very worrying incident," she said. On Wednesday morning, a ZANU-PF supporter wearing party regalia was arrested for campaigning inside a polling station in Bulawayo. An FFZE reporter said he saw the ZANU-PF supporter, whose T-shirt read "Team ZANU-PF", being arrested while handing out free mobile phone sim cards and airtime vouchers to people queuing to vote at a polling centre at Paddonhurst Shopping centre. 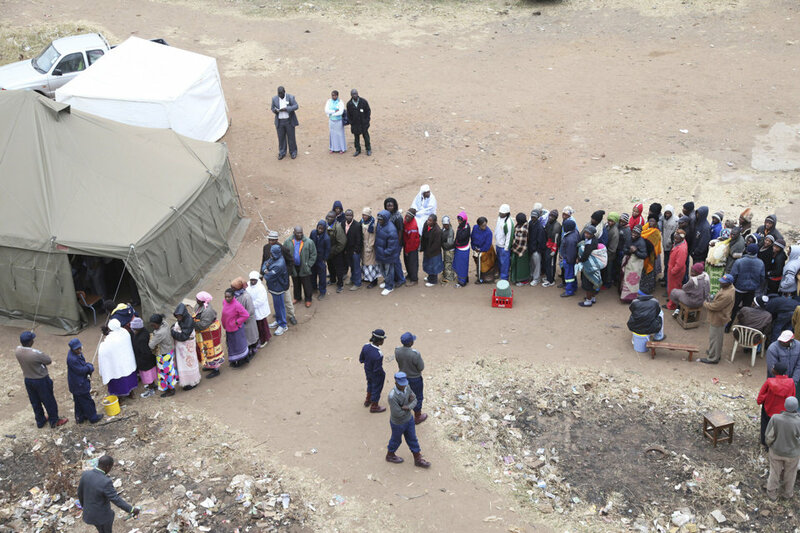 Long queues continue to be experienced in Bulawayo, Zimbabwe's second city, where the voting process is moving slowly, according to monitors. "It is taking as much as 10 minutes to cast a vote. We think that is something that is negative and that is likely to see many people going away in frustration," Mrs Mabunda said. "It would appear that that the slow process is due to the voters' roll that is not clear. People are taking a lot of time searching for their names." The ZEC, which is in charge of the electoral process, was ordered late on Tuesday by the High Court to release the voters' roll to all interested parties by midday Wednesday, five hours after the polls opened. Welshman Ncube, president of the smaller MDC party and a presidential candidate, cast his vote in Bulawayo early Wednesday and urged Mr Mugabe to accept the results. Mr Mugabe said on Tuesday that he will step down if he loses the election. He also said that he had never cheated to win a vote. He has been in power since 1980. Mr Ncube said: "I hope that he means it and that every supporter of every part will accept the results."